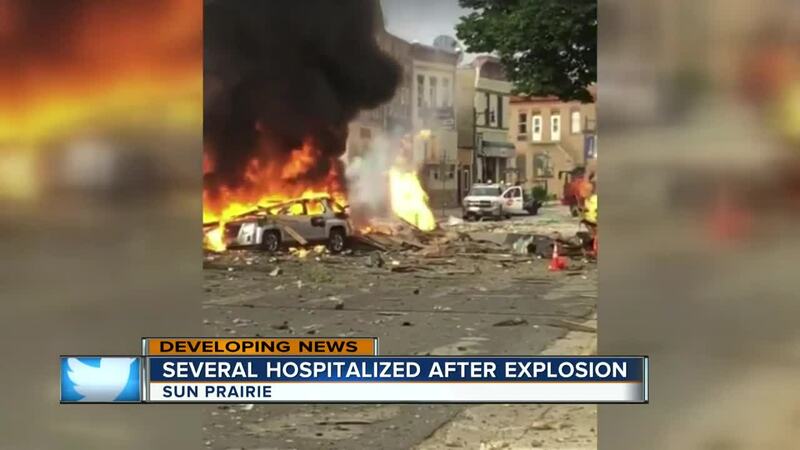 An explosion rocked the downtown area of a suburb of Madison, Wisconsin, after a contractor struck a natural gas main Tuesday, injuring at least two firefighters and a police officer, authorities said. Konopacki said the firefighters and officer were taken to a hospital. He said he didn't know if anyone else was hurt. WE Energies spokeswoman Cathy Schulze said the gas main strike was reported to the utility early Tuesday evening ahead of the explosion. She said the utility's first responders were in the area working to shut off the flow of gas and make the area safe. A massive fire broke out in a suburb of Madison, Wisconsin, on Tuesday after witnesses said they heard a loud boom. Witnesses said the boom around 7:15 p.m. Tuesday shook Sun Prairie. A large plume of smoke was rising from the downtown area in the community of about 30,000 people. Firefighters from Sun Prairie and surrounding communities were responding to the blaze. Details were not immediately clear, and law enforcement and fire officials were not available for comment. Police blocked off downtown streets from traffic and onlookers. The area has several businesses including bars and restaurants.